The 2016 College Football season is less than four weeks away and that means prediction time. Below are five predictions for Mountain West Conference for the 2016 season. Some predictions will be right, some predictions will be wrong, and some will be spectacularly awful (or correct) by the end of the season. There are no changes for the Mountain West Conference as the twelve teams remain the same. The Mountain division is composed of Air Force, Boise State, Colorado State, New Mexico, Utah State, and Wyoming. The West division is made up of Fresno State, Hawaii, Nevada, San Diego State, San Jose State, and UNLV. 1. 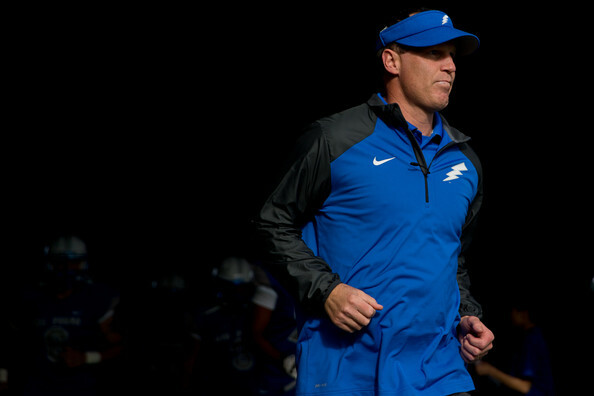 Air Force will win the Commander-in-Chief Trophy and win 10 games – The first part only requires the Falcons to defeat the duo of Army and Navy. The chances are good to get back the CIC for the first time since 2014 (Navy has won the CIC three of the last four years). Navy was decimated on offense with only one returning starter and Air Force is better than Army on paper (that is why they play the games though). Air Force will be returning five starters on offense including their leading rusher Jacobi Owens (1,092 yards and 7 touchdowns) and receiver Jalen Robinette. (26 catches for 641 yards and 5 touchdowns). Also back is quarterback Nate Romine who was the starter to begin 2015, but suffered a torn ACL early in the season. The offense should come close to their 2015 numbers of 33.8 points and 451 yards per game. The defense has nine back from a unit that allowed 25.5 points and 355 yards per game. The entire secondary returns led by strong safety Weston Steelhammer (80 tackles and 5 interceptions) and they will be the anchor of what should be another solid team. The schedule opens with Abilene Christian and Georgia State at home and the Falcons should be poised to go 4-0 in non-conference this year. The Falcons do have five away games in conference, but they are winnable (Utah State, Wyoming, New Mexico, Fresno State, and San Jose State). Their toughest games come at home against Colorado State and Boise State. The Falcons have a great shot at 10 wins in 2016. 2. San Diego State will win the West Division – The Aztecs won the 2015 Mountain West Championship with a 27-24 victory over Air Force. 2016 appears to favor SDSU to get back to the title game again. They return seven starters on both offense and defense led by running back Donnel Pumphrey (1,653 yards and 17 touchdowns), but there are other reasons. First, they avoid the Mountain Division duo of Air Force and Boise State, which makes the road much easier. The second reason is they do not face much in the way of competition in their own division with being Nevada their biggest threat. The Wolf Pack return 10 starters on offense and five on defense, but lost their offensive coordinator Nick Rolovich to Hawaii. Nevada does not have to face Air Force and Boise State from the Mountain as well. San Diego State does have to face Nevada on the road, but they look likely to win the West in a down year for the division. 3. Boise State will lead the MWC in points scored and Thomas Sperbeck will lead the MWC in receiving yardage – The Broncos were easily the best scoring offense in 2015 putting up 39.1 points per game while Air Force was second at 33.8 points per contest. Sperbeck also led the conference in receiving in 2015 with 1,412 yards on 88 catches. The next closest was Colorado State’s Rashard Higgins with 75 catches for 1,062 yards and 8 touchdowns. The offense should easily lead the conference again as they return the young and talented quarterback Brett Rypien (3,353 yards with 20 touchdowns and 8 interceptions) as well as running back Jeremy McNichols (1,337 yards and 20 touchdowns). Sperbeck will be accompanied by Chaz Anderson at receiver as he was the number two receiver with 42 catches for 578 yards and 3 touchdowns. Sperbeck will be the top target and let’s call for at least 1,500 yards in 2016 to lead the MWC. 4. UNLV will make a bowl game in 2016 – Finding an under the radar team from the West division to make a bowl game was tough. Fresno State and Hawaii have tough schedules while San Jose State is hardly under the radar after making the Cure Bowl last year. UNLV made some serious progress during 2015 in Tony Sanchez’s first season. The offense went from 21.9 points and 387 yards per game in 2014 to 28.5 points and 405 yards in 2015 with only five starters back (as well as the new offense under Sanchez). This year six starters return including the talented Devonte Boyd at receiver (1st team all MWC in 2013 and 2nd team all MWC in 2015). The top three running backs return as well as three linemen. They will have a new quarterback, but he is likely to be former Nebraska Cornhusker Johnny Stanton. The offense should surpass the 2015 numbers they put up. The defense went from 38.5 points and 513 yards allowed per game in 2014 down to 33.7 points and 457 yards per contest in 2015. Those numbers should improve again this year as eight starters return. The team was competitive last year and had three losses by a touchdown or less. UNLV will open up against Jackson State, UCLA (away), Central Michigan (away), and Idaho. They also face Fresno State, Hawaii (away), Colorado State, San Jose State (away), and Wyoming in conference, which makes a bowl in reach if they can go 3-1 or even 2-2 out of conference. 5. New Mexico will make their second straight bowl game in 2016 – The Lobos have not been to back-to-back bowl games since 2006 and 2007 when they played in the New Mexico Bowl both times. They played in the same bowl last year against Arizona where they lost 45-37. The offense will have just five starters back from the group that put up 29.9 points and 388 yards per game. Quarterback Lamar Jordan returns after throwing for 1,045 yards with 5 touchdowns and 8 interceptions, but the focus of this offense is the triple option. Jordan ran for 807 yards and 9 touchdowns, but the leading rusher departs. He will be replaced by Teriyon Gipson who ran for 848 yards and 6 touchdowns. They also return the top two receivers from last year, which is a plus if they need to rely on the passing attack a bit more. The defense looks like the strength of the team. In 2014, they allowed 35.9 points and 519 yards per game while 2015 saw an improvement to 28.4 points and 438 yards per game with seven starters back. For 2016, there are ten starters returning including middle linebacker Dakota Cox (97 tackles, 5 sacks, and one interception). There should be even more improvement this year. The schedule opens up with South Dakota before winnable road games against New Mexico State and Rutgers. Their final non-conference game is in mid October against Louisiana Monroe, another winnable contest. In conference, they will have games versus San Jose State, Boise State, Air Force (in Dallas), Hawaii (away), Nevada, Utah State (away), Colorado State (away), and Wyoming. There are at least three wins in there in which they can become eligible for a bowl game (assuming a 3-1 non-conference record). With the MWC predictions above, there are now predictions for six conferences in the books. Below are the predictions completed and which conference is next.